Dry fruits are the dry form of fresh fruits. The water content of the fresh fruits removed by some procedure and the fruits became dry and made to preserve for a long time. This method of making dry fruits originated in the ancient age when there was no refrigerator. So to get the Fruits out of season, people discovered the way to preserve them in dry condition. As the moisture level is almost zero, the shape and size become small, but the nutrition factors remain the same as fresh fruit. Fresh fruits are transformed to dry fruits either naturally or artificially. The natural process includes drying under sun-rays. Artificial methods include using some kind of dehydrator or the particular type of dryers. The fresh fruits undergo some process like washing, cutting in slices, drying, and packing in airtight container---then it is ready to consume throughout the year even when the season end. As there is no water content, it’s almost free of any kind of bacteria. If preserved in an airtight container, it will remain the same. There is a wide range of Dry fruits nowadays. Most common names are Dried Apricot(Jardalu,Khubani,Khumani), Dry Dates (Chuwara), Cashew Nuts, California Almond Kernel (Badam Giri), Raisins (Kishmish), Dried Figs (Anjeer), American Almonds, Salted Pistachio Nuts (Namkeen Pista) and other different kinds of nuts, lums, etc. In present days dry fruit consumption has increased to a level that packed dry fruits are always available in the market to meet up the demand. People nowadays prefers to buy dry fruits and nuts online as it is time saving. So it’s a new trend to buy dry fruits online in packed in beautiful gift boxes. Also the buyer can compare the prices and then order online. There are numbers of dry fruits stores online in India. They supply the customers with a minimum shipping cost at your doorstep. People can choose variety of dry fruits from our online store, KiranaPlace and select the required quantity. Sometimes especially during festival demand of dry fruits increased so much that it takes a long time to buy from the market. So to avoid the hazards of the long wait in a queue, it’s rather easy to buy dry fruits and nuts online in India. Some special offer also attracts the buyer to encourage dry fruits online shopping in India. Give enormous stamina for work. Dry fruits and nuts are the convenient snacks, and the ideal substitute for high-calorie snacks, as they provide natural sugars and fibre, zero cholesterol and fats, and a variety of delicious flavours. 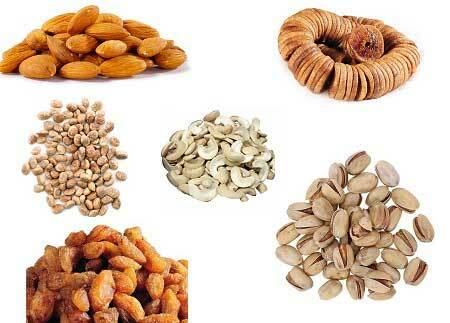 So dry fruits and nuts are very easy to carry and an easy source of all essential nutrients. The right and regular mix of almonds, cashews, dates, raisins and many other dry fruits available which are good for health. So Almond, nuts, apricots are all you need to keep the balance and healthy lifestyle. Use them for garnishing desserts make it even more attractive. Browse through the wide assortment of delicious and nutritious dry fruits and nuts at KiranaPlace, a online dry fruits store.